First paint the pants and polo neck top on the clothespins and set aside to dry. It only takes a few minutes for the paint to soak into the wood and be touch dry. Next wrap some washi tape around the upper bodies to create the stylish ski jackets. Decorate the skiies with some more washi tape..... you might decide to go snowboarding instead with a single craft stick! 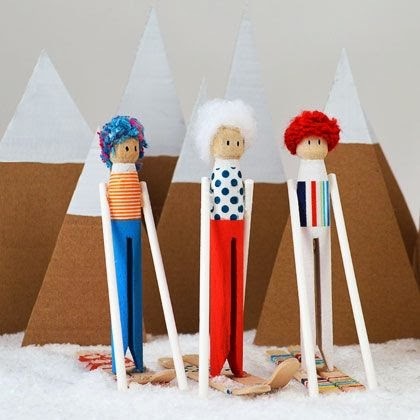 Then heat up your glue gun and glue the doll onto the craft stick skies, and the lollipop stick ski poles to the sides of the body. Give the glue a few moments to set.